Cover of Morbius: The Living Vampire vol. 2 #1 (March 2013). Art by Gabriele Dell'Otto. Morbius the Living Vampire, a.k.a. Dr. Michael Morbius, Ph.D., M.D., is a fictional character appearing in American comic books published by Marvel Comics. Created by writer Roy Thomas and originally designed by penciler Gil Kane, the character first appeared as an antagonist in The Amazing Spider-Man #101 (Oct. 1971). Despite his initial status as one of Spider-Man's horror-based rogues, Morbius went on to become a brooding and gritty, albeit heroic and tragically flawed antihero in his own series and other titles. Morbius' true identity is that of a former award-winning biochemist named Michael Morbius, who is imbued with pseudo-vampiric superhuman abilities and physical traits stemming from a failed biochemical experiment which was intended to cure his rare blood disorder, as opposed to supernatural means, with the rest of his appearances featuring his struggles with his inhuman-like vampiric persona, his insatiable lust for human blood and his subsequent efforts to cure his horrific condition, along with his eventual stint as a brutal and nightmarish vigilante. The character has appeared in various animated shows and video games. Jared Leto will portray the character in a live-action film adaptation set to be part of Sony's Marvel Universe. Morbius debuted in The Amazing Spider-Man #101 (cover-dated Oct. 1971) following the February 1971 updating of the comic-book industry's self-censorship board, the Comics Code Authority, that lifted a ban on vampires and certain other supernatural characters. It was the first issue of Marvel Comics' flagship Spider-Man series written by someone other than character co-creator and editor-in-chief Stan Lee. Lee, busy writing a screenplay for an unproduced science fiction movie, bequeathed the series to his right-hand editor, Roy Thomas. "We were talking about doing Dracula, but Stan wanted a costumed villain. Other than that, he didn't specify what we should do," Thomas said in 2009, adding that part of the character conception came from an unspecified science-fiction film of Thomas' youth, depicting a man turned into a vampire by radiation rather than magic. Thomas said that the name "Morbius" was not deliberately taken from the antagonist Doctor Morbius in the movie Forbidden Planet. Thomas and penciler co-creator Gil Kane created the character as a man who is given pseudo-vampiric abilities and traits via scientific rather than supernatural means. Kane based the character's look on that of actor Jack Palance. 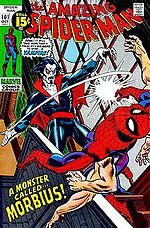 A tragic and sympathetic antagonist in his initial two-issue story arc, having acquired his vampiric addiction while researching a cure for his own rare, fatal blood disease, Morbius collided again with Spider-Man and others in Marvel Team-Up #3–4 (July and Sept. 1972) and the one-shot issue Giant-Size Super-Heroes #1 (June 1974). Morbius went on to star in Vampire Tales, a black-and-white horror comics magazine published by Marvel's sister company, Curtis Magazines, appearing in all but two of the mature-audience title's 11 issues (Aug. 1973–June 1975). All but the first and last of these were written by Don McGregor, with penciling by Rich Buckler and by Tom Sutton, primarily. The Amazing Spider-Man #101 (Oct. 1971), the first appearance of Morbius. Cover art by Gil Kane and John Romita Sr. Adventure into Fear #20 (Feb. 1974), Morbius' first starring feature in comics. Cover art by Gil Kane and Frank Giacoia. After his first two Vampire Tales stories, Morbius concurrently became the star of his own feature in Marvel's bimonthly Adventure into Fear anthology series, beginning with issue #20 (Feb. 1974) and continuing through issue #31 (Dec. 1975), the last issue of that title. These were written, successively, by Mike Friedrich, Steve Gerber (who had written the first Morbius solo story in Vampire Tales #1), Doug Moench and Bill Mantlo, working with a wide variety of pencilers. Following sporadic guest appearances throughout the next 16 years, Morbius was revived in the 1992 series Morbius the Living Vampire, launched as part of the "Rise of the Midnight Sons" crossover story arc in Marvel's supernatural/horror comics. It ran for 32 issues (Sept. 1992–April 1995). These later stories add to his repertoire of powers the ability to hypnotize others and describe his ability to fly as psionic in nature. A one-shot special, tentatively titled Spider-Man/Venom/Morbius by Morbius writer Len Kaminski, was scheduled for 1993, but never saw print due to the writer's departure from the series out of disgust with Morbius penciler Ron Wagner. Wagner felt that Kaminski's stories were too character-driven and Kaminski claimed that Wagner complained about the stories to the editorial staff and left "snide margin notes in which he made his personal opinion of my plots clear" (Kaminski would see these notes because he and Wagner worked under the Marvel method), but ignored Kaminski's attempts to get in touch with him so that they could discuss how the comic should be done. Series colorist Gregory Wright stepped in as writer with issue #9 and delivered the bloodshed-heavy stories Wagner wanted. Despite this, Wagner lasted just six issues longer than Kaminski on the series. Wright stayed with Morbius through issue #23. On October 17, 2012, Marvel announced that Morbius would appear in a new comic by writer Joe Keatinge and artist Richard Elson, beginning January 2013. Born and raised in Greece by a single mother, Michael Morbius experienced an isolated childhood due to his rare blood condition, which contributed to his ugly and unpleasant-looking appearance. But despite his looks, he was an intellectually-gifted young man who spent his time reading books and, in time, became a highly-respected and Nobel Prize-winning biologist who specialized in the field of human and animal biology. While in New York, after escaping from his original country due to his vampiric condition, he attempted to find a cure and to protect his fiancee Martine Bancroft, but he was attacked by the Lizard and defeated when Spider-Man and the Lizard fought against him to recover a sample of Morbius' blood in order to cure their own mutated physical conditions before he disappeared. The truth behind his horrific condition is that in order to cure his decaying blood condition, Morbius, using his past experience as an expert biochemist, had attempted to cure himself of his blood disease with an experimental treatment involving vampire bat DNA and electroshock therapy. However, he instead became afflicted with a far worse condition, "pseudo-vampirism", that mimicked the powers and bloodthirst of legendary vampirism. Morbius now had to digest blood in order to survive and had a strong aversion to light. He gained the ability to fly, as well as superhuman strength, speed, and healing abilities. His appearance, already ugly, became hideous—his canine teeth extended into fangs, his nose flattened to appear more like a bat's and his skin became chalk-white. He also gained the ability to turn others into similar "living vampires" by biting them, infecting them with the disease of pseudo-vampirism. He later sought a cure for his condition, but battled Spider-Man, the Human Torch, and the original X-Men. He caused John Jameson to again become the Man-Wolf. Alongside the Man-Wolf, he battled Spider-Man again. Morbius later rescued Amanda Saint from the Demon-Fire cult and aided her in her quest for her missing parents. He battled Reverend Daemond and encountered the Caretakers of Arcturus IV. He visited the Land Within, home of the Cat People, and the planet Arcturus IV. He also first encountered Blade. He then first encountered Simon Stroud and battled the demon Helleyes. Alongside the Legion of Monsters, he then encountered the Starseed. Morbius then battled the Thing, encountered the Living Eraser, and traveled to Dimension Z. He later returned to Earth and battled Spider-Man again, this time briefly controlled by an extra-dimensional humanoid android called the Empathoid, which fed on emotions to survive. He once again fought Spider-Man, but then he was hit by a lightning strike, which cured him of his pseudo-vampirism and made him human again (he still retained a thirst for blood, however). While cured, he was charged with the crimes he had committed as a pseudo-vampire and was represented by Jennifer Walters, whose dual identity as the She-Hulk was not yet publicly known. Morbius selflessly saved Walters' life and stabilized her erratic transformations into the She-Hulk with a serum that he had created to cure the remnants of his own transformation. He eventually resumed his pseudo-vampiric state and first met Doctor Strange. Alongside Doctor Strange and Brother Voodoo, he battled Marie Leveau and witnessed the resurgence of true vampires. Morbius later battled Spider-Man in the New York sewers. The Ghost Rider and John Blaze searched for Morbius to form the Nine and stop Lilith and the Lilin from taking over the world. When they found Morbius, the pseudo-vampire believed they would kill him, but Ghost Rider and John Blaze successfully captured him. Doctor Langford, who tried to help Morbius' wounds, was trying to kill him and was working for Doctor Paine. He made an unknown mutagenic serum that would prove fatal to Morbius. Unknown to Doctor Langford, Fang, one of Lilith's children, was also trying to kill Morbius by adding his own demonic blood to the serum, which would also be fatal to Morbius. When Doctor Langford injected the serum to Morbius, it did not kill him, but instead it mutated him. Morbius' friend, Jacob, was trying to look inside of him and see what he could do about Morbius' condition. After Martine Bancroft, Morbius' ex-fiancée, found out that Langford was trying to kill him, Langford shot her and she bled to death. Morbius found this out and was enraged to find his ex-fiancée dead. He later avenged the death of Martine Bancroft by killing Langford and took the beaker which contained the serum. The Ghost Rider and John Blaze later found out about Morbius' destruction. The Ghost Rider confronted him and would not tolerate Morbius drinking any more innocent blood. Morbius then vowed he would only drink the blood of the guilty. The Ghost Rider accepted the vow, but warned him not to stray from it. Morbius soon became part of the Midnight Sons. It was later revealed that Morbius had signed the Superhuman Registration Act and was cooperating with S.H.I.E.L.D. in an effort to capture Blade. He had also presumably survived his genetic manipulation, as Blade was able to distinguish him as the same Morbius who 'took a bite out of [him]' in their previous encounter. Morbius was next seen as a member of A.R.M.O.R., held captive by the zombie Morbius from the Marvel Zombies universe. He survived the invasion, killing his zombified counterpart in the process. Shortly after, he formed a new Midnight Sons with Jennifer Kale, Daimon Hellstrom, Jack Russell, and the Man-Thing to contain a zombie outbreak on an isolated island, briefly running afoul of the Hood in the process. Morbius later helped the Man-Thing reassemble a decapitated Punisher into a Frankenstein-like monster called FrankenCastle. During The Gauntlet storyline, Morbius was behind the theft of a vial of Spider-Man's blood. Spider-Man, learning that Morbius is planning to use the blood samples to create a cure for Jack Russell, agreed to help Morbius by giving him more blood. During the Origin of the Species storyline, Morbius was among the supervillains recruited by Doctor Octopus to secure some items for him. During the events of Spider-Island, it was revealed to the reader that Morbius was the mysterious Number Six working at Horizon Labs. He assisted, in a hazmat suit to protect his identity, in preparing the cure to the spider-powers virus. When Peter Parker tried to investigate the identity of "Number Six", he accidentally provoked Morbius—who had been using the cure to try to develop a basis for his own condition—into a frenzy, prompting the staff at Horizon to step up building security (making it harder for Peter to enter and exit the building as Spider-Man in the future) and also forcing Morbius to leave, where it was revealed that he had been working with the Lizard, presumably trying to find a cure for both of their conditions. It was also revealed that Michael Morbius was a college friend of Max Modell. Using DNA samples from the corpse of Billy Connors, Morbius was able to create a cure that would restore the Lizard to human form, but he failed to recognize that the Lizard had fully destroyed Curt Connors' human persona. They left the Lizard alone in Morbius' lab, allowing the Lizard to release blood into the lab's air supply to provoke the injured Morbius into attacking the other Horizon scientists. This prompted Morbius to flee the lab with Spider-Man in pursuit. Morbius was captured by Spider-Man and locked up in a cell in the Raft. When Peter Parker (now in Doctor Octopus' dying body) needs some supervillains to help capture Doctor Octopus (now in Spider-Man's body), Morbius offers to help, but is rejected. Morbius eventually escapes from the Raft and flees to Brownsville. After some time, he tried to stop some vampires in Barcelona, but got captured by them and locked in a coffin. The vampires wanted to mix their blood with that of Morbius, until he got unintentionally saved by Domino, Diamondback and the Outlaw. After telling them about the vampires' plan, they agree to help him kill King Morbius (a vampire with Morbius' blood). Then after killing him, a vampire hunter tried to kill Morbius, but thanks to Domino, he flew away. Morbius later appears as a member of the Agents of Wakanda. At the time when Man-Wolf was fighting vampires on the Moon, Morbius states to Wasp that his vampire nature was the result of a scientific experiment. Michael Morbius experienced a transformation by electrical shock treatment and chemical ingestion into a pseudo-vampire. As a pseudo-vampire, Morbius does not possess all the powers of a supernatural vampire, nor is he subject to all the traditional limitations and weaknesses thereof. He possesses a variety of superhuman powers, some of which are similar to supernatural vampires within the Marvel Universe, such as superhuman strength and speed, as well as heightened senses including night vision and echolocation. Due to his vampire-like condition, Morbius is forced to ingest fresh blood on a regular basis to sustain his life and vitality. How much blood he requires and how often he has to feed has not been specified in the comics. However, Morbius does not possess any of the mystical vulnerabilities that supernatural vampires are subject to, such as garlic, holy water, crucifixes, or silver. Morbius has a strong aversion to sunlight, thanks to his photo-sensitive skin which prevents any protection from major sunburn, in contrast to "true" vampires that are incinerated by it, with the result that he can move in daylight, but his powers are diminished and he will stick to the shade if circumstances demand him to be active during the day. Morbius also lacks the shapeshifting and weather-control powers of supernatural vampires and the ability to control the minds of certain animals. Like "true" vampires, Morbius does possess the ability to hypnotize beings of lesser willpower and bring them under his control, which can only be resisted by those possessing an extremely strong will. While briefly infected by the demon Bloodthirst, Morbius gained the ability to liquidize his body, moving through small spaces and stretching his limbs as needed. He lost these abilities when he and Bloodthirst split. Morbius possesses an accelerated healing factor and can recover from mild to moderate injuries at a rate beyond that of ordinary humans. While not nearly as efficient as the healing powers possessed by Wolverine, Morbius has proven able to heal from multiple gunshot wounds in less than one hour. More severe injuries, such as broken bones or severe burns, might take several days to heal, but once it was shown to take minutes, even though it left him as a near-mindless creature who must feed to replenish the energy that was used to do so. He is unable to regenerate missing limbs or organs. Most of Morbius' victims die or are severely injured by his bite. Unlike supernatural vampires, Morbius' victims do not necessarily become pseudo-vampires themselves. There have only been six instances where Morbius' bite has turned other individuals into pseudo-vampires: Jefferson Bolt (a young man first seen in Marvel Team-Up #3), Emilio (a young man first shown in Peter Parker, the Spectacular Spider-Man #7), Vic Slaughter (a bounty hunter who first appeared in Morbius the Living Vampire #7), Nate Grey (in X-Man #24), Roxy (a junkie dying of a drug overdose in Legion of Monsters: Morbius #1) and Blade the Vampire-Slayer (in Peter Parker: Spider-Man #8). The causes behind these transformations have never been clearly explained, even though, in Blade's case, Morbius' bite combined with his unique physiology to turn him into a part-vampire with all the strengths of a traditional vampire and none of the weaknesses. The irradiated blood of Spider-Man causes Morbius's vampirism to go into remission. As a result, after drinking Spider-Man's blood, Morbius does not need to feed again for some time. Morbius once developed a serum based on Spider-Man's blood, which would stave off his vampirism for short periods of time. Morbius possesses the ability of transvection, navigating wind currents and gliding for various distances. In Morbius the Living Vampire #2, it was alluded to that this ability may be related to hyper-evolved portions of his brain, caused by a combination of his blood disease and pseudo-vampiric condition. Even before he contracted the disease of pseudo-vampirism, Michael Morbius already possessed a gifted intellect. He is an expert biologist, biochemist and neuroradiologist with a Ph.D. in biochemistry and a Nobel laureate. He also attended medical school, where he specialized in hematology. Morbius was first introduced as a villain in the pages of The Amazing Spider-Man #101-102. He would return to battle Spider-Man over the years in Marvel Team-Up vol. 1 #3-4; Giant-Size Super-Heroes #1; Peter Parker, the Spectacular Spider-Man #6-8 and #38; Morbius the Living Vampire #3-4 and #21-23; and Peter Parker, Spider-Man vol. 1 #77-80 and vol. 2 #8. Spider-Man and Morbius formed an uneasy alliance during the Maximum Carnage crossover series. Blade the Vampire-Slayer and Morbius have had an ongoing feud which began in Adventure into Fear #24. The two also clashed in Marvel Preview #8, Blade the Vampire Hunter #8, Blade vol. 1 #2-3, and Blade vol. 4 #5. Blade, while possessed by a demonic presence, killed Morbius in Morbius the Living Vampire #12, but Morbius was resurrected in Spirits of Vengeance #13. Simon Stroud, a rogue CIA agent first introduced hunting the Man-Wolf in the pages of Creatures on the Loose, has been hunting Morbius since Adventure into Fear #27. Stroud and Morbius last clashed in Morbius the Living Vampire #23. During the run of Morbius the Living Vampire, Morbius crossed paths with a handful of brand new foes. They included Vic Slaughter (introduced in issue #7), the Basilisk (Wayne Gifford) (introduced in issue #5), Doctor Paine (introduced in issue #4) and Bloodthirst (introduced in issue #20). During this same period, Morbius also battled a new villain called Bloodbath in Midnight Sons Unlimited #2. Morbius has had a friendship with Jack Russell (the Werewolf by Night) since West Coast Avengers #5, where Morbius helped Russell deal with his werewolf curse. The Werewolf by Night was a frequent guest star in the pages of Morbius the Living Vampire. Together with the Man-Thing and the Ghost Rider (Johnny Blaze), they formed the short-lived Legion of Monsters in Marvel Premiere #28. Morbius and Doctor Strange have teamed up on several occasions. Morbius appeared sporadically throughout the run of Doctor Strange: Sorcerer Supreme, beginning with issue #10. Doctor Strange recruited Morbius as one of "the Nine" a.k.a. the Midnight Sons, a team with only one purpose: Earth's last defense against the occult. In the House of M series, Michael Morbius appears in a flashback as one of the scientists (along with Jonas Harrow and Farley Stillwell) that gave Luke Cage his powers. Morbius appears in Dead of Night featuring Werewolf by Night as one of the anomalous beings contained and experimented on by the Babylon Group. When Jack Russell attempts to escape from the Babylon Group with his infant daughter, the facility tries to stop him by unleashing Morbius and Frankenstein's Monster. In the ensuing brawl, Morbius' heart is punched out by Frankenstein's Monster. A zombified version of Morbius appears in the 2008-2009 Marvel Zombies 3 miniseries. The real Morbius of Earth-616 (the mainstream universe) is kidnapped and beaten by his zombie counterpart who found a way from the Marvel Zombies universe into the Marvel universe. Zombie Morbius holds the real one captive while using a latex mask to look normal. It is revealed that he plans to infect every member of the Fifty State Initiative with the zombie virus. His captivity is later inadvertently uncovered by an A.R.M.O.R. team member, whom Morbius tries to warn of an impending attack. The warning comes too late, as Morbius' zombie counterpart attacks the team member and infects her, thus creating a violent chain of events after she attacks another team member. Towards the end of the crisis, the real Morbius appears out of nowhere and grabs a tree, which he uses as a stake and stabs the zombified version from behind and straight into the heart, killing him instantly. The Ultimate Marvel version of Morbius is a "true" vampire, the son of Dracul and brother of Vlad III Dracula himself. He has all of the powers and abilities associated with the usual interpretation of Dracula. This version of Morbius, however, seems to be heroically struggling against his baser instincts and is in fact a vampire hunter. He meets Spider-Man in a typical misunderstanding, centering on a cabal of vampires attacking Ben Urich. He is really trying to stop Urich from becoming a vampire, which he succeeds in doing despite the conflict. When Spider-Man is bitten by a vampire, Morbius sniffs and determines that the young superhero is immune to vampirism. In the universe of Peni Parker, M.O.R.B.I.U.S. is a techno-organic dragon-like kaiju with tentacles, which feeds on technology. During the battle between SP//dr and VEN#m, it attacks VEN#m and overloads it sending the black mech crazy. In the Web-Slinger's universe that takes place in the Old West, Doc Morbius is similar to the Earth-616 counterpart, but he wants to get his sickness cured by experimenting on people and when he was ready to experiment on some children. Web-Slinger came into the lab and started battling Morbius. During the fight, the chemicals caught fire and Morbius realizes what he was doing. He sacrifices himself to save Web-Slinger and the children from the exploding chemicals. In this new universe, Morbius is fused with Morpheus. He tries to steal some blood tanks, but is defeated by Arachknight. Morbius, the Living Vampire as seen in Spider-Man: The Animated Series. Morbius the Living Vampire appeared in Spider-Man: The Animated Series, voiced by Nick Jameson. The character first appeared in his human form in "The Insidious Six" and "Battle of the Insidious Six", where he had a romance with Felicia Hardy. In his self-titled episode "Morbius", he stole a vial of Peter Parker's blood in the belief this was part of Parker's entry in a science competition that they were both competing in. While examining Peter's blood in his laboratory, one of the vampire bats he was experimenting on escaped and began to lap it up. When Morbius tried to scare the bat away, it bit him. The bite infected him with Parker's irradiated blood, transforming Morbius into a living vampire. Morbius appeared as a villain in the next four episodes ("Enter the Punisher", "Duel of the Hunters", "Blade the Vampire Hunter" and "The Immortal Vampire"). This incarnation was vulnerable to garlic and garlic-enhanced weaponry. Blade uses garlic gas grenades against him and Spider-Man uses similar garlic-based oils in his own webbing, which hurt and nearly restrain Morbius. However, Felicia manages to appeal to Morbius' humanity and Morbius redeems himself by this episode's end, where he flies away upon being mutated into a bat-like form. Morbius appears in the episode "The Awakening", where Alistair Smythe abducts the capsule containing the mutated Morbius as he is restored to normal. In the episode "The Vampire Queen", Morbius joins forces with vampire hunter Blade and the Black Cat to stop Blade's evil mother Mirium. Morbius is revealed to have a psychic link to the more conventional supernatural vampires such as Mirium. Morbius made a cameo at the beginning and end of the animated version of "Secret Wars" (along with Blade), concerned about stopping Mirium and curious where the Black Cat had gone, as the Black Cat had been transported from Earth to the Secret Wars planet to fight alongside Spider-Man. That was Morbius' last appearance in the show. Morbius had suckers on his palms to drain his victims with "plasma". Michael Morbius appears in Ultimate Spider-Man Vs The Sinister Six, voiced by Benjamin Diskin. This version is a symbiote scientist employed by HYDRA. In the episode "Anti-Venom", he gets brought in by Arnim Zola to work with Doctor Octopus. Morbius's questions about Doctor Octopus's techniques are 'not entirely ignorant', even providing small suggestions that help in the Anti-Venom symbiote's creation. When Spider-Man, Agent Venom and the Patrioteer find the HYDRA lab, Morbius witnesses Doctor Octopus unleash the Anti-Venom symbiote on a rampage. As Agent Venom and Iron Patriot fight Anti-Venom and Doctor Octopus, Spider-Man webs up Morbius, to which the HYDRA scientist instantly reveals that Anti-Venom can be contained in an ion-powered inhibitor. After Spider-Man and Iron Patriot get away with Agent Venom and Anti-Venom, Doctor Octopus finds Morbius webbed up; Morbius stating that Spider-Man forced the information out of him. Morbius has a central role in the multi-part "Symbiote Saga". Michael (in HYDRA armor) ambushes Spider-Man and Agent Venom in order to claim a symbiote sample. With Doctor Octopus as a shackled assistant, Morbius's experiments results in the Carnage symbiote's creation for HYDRA under Crossbones's orders. During another fight against Spider-Man and Agent Venom, Doctor Octopus injects Michael with a vampire bat DNA serum, leading to him to use the Carnage symbiote to envelop Doctor Octopus. The DNA serum ends up mutating the HYDRA scientist into a humanoid bat with wings instead of arms as he escapes out of HYDRA's building. However, the Living Vampire has later somehow regressed to his classical comic appearance, except for the fact that he has bat wings on his back and can drain the life-force energy from anyone. The Living Vampire arrives at the enveloped Midtown High where he competes against Spider-Man, Agent Venom and the Patrioteer to get to the building's core, resulting in both sides' encounter with the Carnage Queen. Getting control of the Carnage Queen, the Living Vampire takes out Spider-Man, Agent Venom and the Patrioteer so that he and Crossbones could use deactivated HYDRA missiles that S.H.I.E.L.D. confiscated to send HYDRA's symbiote samples to every city in the world. The Living Vampire's plan gets thwarted when Spider-Man breaks the Carnage Queen's control device. As Crossbones gets away, the Living Vampire drains the Carnage Queen's energy, however, this has no effect and the Carnage Queen counterdrains energy from him. In 2000, Marvel Entertainment entered into a joint venture agreement with Artisan Entertainment to turn at least 15 Marvel superhero franchises into live-action films, television series, direct-to-video films and internet projects. These franchises included an adaptation of the character. In the bonus features of the Blade film DVD under the La Magra title, an alternate ending can be seen where Blade, after dispatching Deacon Frost, walks out onto the rooftop of a building only to glimpse a figure whose identity is concealed behind a cloth mask. The film's writer David S. Goyer has stated that this character is Michael Morbius, and that he originally intended Morbius to be the primary villain should there be a sequel to Blade. This was eventually scrapped in favor of the Reaper storyline in Blade II. In November 2017, Sony Pictures announced plans to make a film adaptation of Morbius that will be part of their Sony's Marvel Universe. The film is to be written by Matt Sazama and Burk Sharpless. On June 27, 2018, it was announced that Jared Leto will star and Daniel Espinosa will direct. Production was slated to begin in November of 2018. By October 2018, Venom producer Avi Arad confirmed filming will begin as early as February 2019. The film will also feature Martine Bancroft and Loxias Crown. It is scheduled to be released on July 31, 2020. Morbius appeared as a non-playable "call-in" character in Spider-Man and Venom: Maximum Carnage. When summoned, he distracts or injures enemies, depending on which title character the player is utilizing. Morbius appears in the Wii, PS2 and PSP versions of Spider-Man 3, voiced by Sean Donnellan. In this version, he has a wife - Frances Louise Barrison-Morbius. Spider-Man spends many parts of the game trying to find a cure for Morbius. This involves battling Morbius and also involves a part of the symbiote and his wife Francis. Morbius is a playable character in Marvel Super Hero Squad Online. Morbius appears as an unlockable character in Marvel: Avengers Alliance. Morbius appears as a playable character in Lego Marvel Super Heroes 2. A bonus mission narrated by Gwenpool that takes place in the HYDRA Empire section of Chronopolis has Morbius the Living Vampire, N'Kantu the Living Mummy and the Man-Thing making a parade float for the HYDRA Empire's Red Skull Honorary Parade in HYDRA Square, so that they can get people not to fear them. In The Amazing Spider-Man newspaper strip, Morbius returns to New York, seemingly cured of his vampirism, and with a fiancée, Martine Bancroft, in tow; however, at night he begins exhibiting his old symptoms and comes into conflict with Spider-Man. It is later revealed that his fiance is behind his troubles; indeed, she is also revealed to have vampire-like abilities. Confronting his fiance on the roof of their apartment, Morbius learns that, in Martine's search for a cure to Morbius' vampirism, she stumbled on the tomb of Dracula and was attacked and murdered by him. Dracula fed off her blood and, in doing so, converted her. Having been secretly converting him at night, Martine attempts to persuade Morbius to join the brotherhood of vampires by feeding on a human being she has captured Mary Jane Watson-Parker, but Morbius refuses. Spider-Man interrupts the two, but is knocked unconscious by Martine in a brief struggle. Martine demands Morbius feast on Spider-Man's blood, but when he again refuses, she threatens the life of MJ. Morbius again proves defiant and saves MJ, but in the process Martine loses her balance and plummets from the roof, with Morbius diving after her. Spider-Man recovers, but can only use his webbing to save one of them. He successfully snags Morbius, but Martine falls to her death. Morbius forgives Spider-Man and mourns his lost love. Morbius the Living Vampire was ranked #10 on a listing of Marvel Comics' monster characters in 2015. ^ Cronin, Brian (July 16, 2009). "Comic Book Legends Revealed". Comic Book Resources. Retrieved 2012-05-07. ^ a b c Buchanan, Bruce (October 2009). "Morbius the Living Vampirez". Back Issue (#36). TwoMorrows Publishing. p. 29. ^ Kane in Ringgenberg, Steve (n.d.). "Gil Kane". Comic Art & Graffix Gallery. Archived from the original on December 11, 1997. Retrieved 2014-02-25. ^ Morbius did not appear in #6 or #9; reprinted Morbius stories appeared in Vampire Tales Super Annual #1 (summer 1975). ^ a b Meth, Clifford (June 1993). "Going for the Throat". Wizard (#22). pp. 90–93. ^ Ching, Albert (25 August 2012). "'Morbius the Living Vampire' Rises in New Ongoing Series". Marvel.com. Retrieved 17 October 2012. ^ Persons whom Morbius infected with the disease of pseudo-vampirism did not truly die as a result and they could be cured through an antidote to pseudo-vampirism that Morbius discovered, though that antidote would not work on Morbius himself. They did not acquire his healing abilities and a mortal wound would kill them. ^ Domino #7-8. Marvel Comics. ^ Avengers Vol. 8 #12. Marvel Comics. ^ Edge of Spider-Geddon #2. Marvel Comics. ^ Vault of Spiders #1. Marvel Comics. ^ Fleming, Michael (May 16, 2000). "Artisan deal a real Marvel". Variety. Deadline Hollywood. Retrieved May 10, 2016. ^ Dave Trumbore (November 13, 2017). "'Morbius': Marvel's Living Vampire Movie in the Works as a 'Spider-Man' Spin-off". Retrieved November 13, 2017. ^ Borys Kit. "Jared Leto to star in Sony Spider-Man title 'Morbius', Daniel Espinosa to Direct". Retrieved June 27, 2018. ^ Cooper Hood (July 20, 2018). "Sony's Morbius Movie: Villain Details & Filming Start Revealed". Retrieved September 29, 2018. ^ Marc, Christopher (October 9, 2018). "Producers Hint Jared Leto's Morbius Could Begin Filming Around February". OmegaUnderground. Geeks WorldWide. Retrieved October 9, 2018. ^ Murphy, Charles (August 8, 2018). "EXCLUSIVE: Sony's 'MORBIUS' Will Feature Martine Bancroft As Female Lead". That Hastag Show. Retrieved August 8, 2018. ^ Murphy, Charles (October 16, 2018). "EXCLUSIVE: Sony's 'MORBIUS' Villain Revealed". That Hastag Show. Retrieved October 16, 2018. ^ Hipes, Patrick (January 25, 2019). "'Morbius' & 'Ghostbusters' Solidify Summer 2020 Release Dates". Deadline Hollywood. Retrieved January 25, 2019. ^ "Characters". IGN Database. Retrieved 22 December 2017. ^ Buxton, Marc (October 30, 2015). "Marvel's 31 Best Monsters". Den of Geek. Archived from the original on September 30, 2018. Morbius may have started out as a way Marvel could scratch its monstrous itch but the not so good doctor became the first true horror character of the Marvel Age and remains a Marvel staple. Star Trek: The Next Generation - "Contagion"
This page was last edited on 22 April 2019, at 00:24 (UTC).